We’d love your help. Let us know what’s wrong with this preview of Quilted by Christmas by Jodie Bailey. Taryn McKenna believes she’s easy to forget. Abandoned by her parents and left behind when her high school sweetheart joined the army, she vows to never love again and throws herself into her love for the outdoors and the pursuit of a college degree—something no one else in her family has e A grandmother’s last wish is to communicate God’s love through an Irish chain quilt. To ask other readers questions about Quilted by Christmas, please sign up. * I was given this book from the publisher and NetGalley in exchange for my honest review. I read this book just before Christmas because I needed an uplifting story built on Christian principles and, hopefully, would be a good Christmas read. And it was! "Quilted by Christmas" is a simply told, sweetly depicted story of love, tender care, lost and regained hope, mistakes made and being confused, and trying to walk God's path. It is about God's redemptive love for His children through forgiveness, tender mercy, and the love that only God can give. "Quilted by Christmas" is a part of t I read this book just before Christmas because I needed an uplifting story built on Christian principles and, hopefully, would be a good Christmas read. And it was! "Quilted by Christmas" is a simply told, sweetly depicted story of love, tender care, lost and regained hope, mistakes made and being confused, and trying to walk God's path. It is about God's redemptive love for His children through forgiveness, tender mercy, and the love that only God can give. "Quilted by Christmas" is a part of the "Quilts of Love - Every Quilt Has a Story" series. This is the first one I have read but will look for others. But I want to find more of Jodie Bailey as she writes so very well. Tender love between a young woman, Taryn McKenna, and her grandmother, Jemma, who raised Taryn after her mother died is central to the story as is the relationship between a young man, Justin Callahan, and Taryn. The two young people have not seen one another for twelve years, but when they reconnect, they find that what they felt when they were eighteen still had a strong hold on their hearts. They also carry baggage from their earlier relationship and the years in between. Yet, if they are to share any future life, guilt, words spoken in anger, and words never spoken, and much more must be spread out before and between them. Taryn thinks she needs to stand strong and independent, yet finds that these characteristics of hers must be given to God so He can wrap His arms of caring, forgiveness, and love around her. There are pieces of Justin and Jemma's lives that must also come to the Cross. This sweet story is really about the way God has a perfect plan for each of us when we allow Him to go before us. I highly recommend this "Quilted by Christmas," but make sure you allow yourself room to ponder. I am so glad to have discovered the writing of Jodie Bailey because I loved everything about her newest book, Quilted by Christmas, and believe all who read it will be blessed. While I've enjoyed every book I've read in the Quilts of Love series, some stand out for various reasons, and Quilted by Christmas falls into that category for me. With its character-driven narrative, small-town setting, engaging characters, emotional romance and plot, this is a story that pulls at the heartstrings. Each book in this series stands alone, with the making of quilts with special meaning being the unifying theme. The quilt in this story is the Irish chain, a long-standing tradition in the McKenna family as mothers make hand-sewn quilts for their children when they marry. Quilted by Christmas opens as the small town of Hollings, nestled in a valley of the Blue Ridge Mountains in North Carolina, is preparing for Christmas. I've spent many family vacations in these mountains and appreciated the sense of place that Jodie vividly conveyed. And there's a realness in the characters, flaws and all - or maybe because of their flaws. Hurt by her father's uncaring attitude while growing up and made to feel she didn't matter, the 18-year-old Taryn searched for something to fill that void and latched on to Justin, even to the point of trying to manipulate him out of neediness into staying in Hollings. In Marnie's words, "Justin was your addiction and you were always afraid he'd vanish." And the result was that she kept a secret that she shouldn't have, a secret that wasn't hers to keep. Now more than a decade later, Justin returns to Hollings in the opening pages and Taryn is faced with the guilt of a past that is no longer hidden. Jemma, Taryn's grandmother, is at the heart of this story and quickly captured my heart. Jemma is feisty, a force to be reckoned with, and she "could pretty much get anything she wanted with a well-pointed stare." And with her loving nature, a servant's heart, and a fierce protectiveness, she reminds me of my own grandmother. One of the story's themes is about doing the right thing, even when the reasons are wrong or misguided. Spiritual elements are strong and feel like a natural part of the characters' lives, such as Taryn's crisis of faith where she comes to understand the heart of a truly loving Father. I highly recommend Quilted by Christmas and hope many readers discover Jodie Bailey's stories. Jodie is a writer of quality and I would love to see more family relationship stories from her with the same Blue Ridge Mountain setting. Quilted By Christmas by Jodie Bailey is more than just a nice warm Christmas story, with a feel-good factor. It is a novel that deals with a whole host of topics - love, guilt, forgiveness - and a novel that will get you thinking, particularly about the love that God has for all His children. Taryn, the main character is likeable and realistically drawn. She could be any one of us. Earlier, in what she perceived as an act of love, Taryn did something that was to consume her waking hours for the Quilted By Christmas by Jodie Bailey is more than just a nice warm Christmas story, with a feel-good factor. It is a novel that deals with a whole host of topics - love, guilt, forgiveness - and a novel that will get you thinking, particularly about the love that God has for all His children. Taryn, the main character is likeable and realistically drawn. She could be any one of us. Earlier, in what she perceived as an act of love, Taryn did something that was to consume her waking hours for the next twelve years. Taryn laid human emotions on God, and in her guilt and anger against herself, she did not believe that God could love her unconditionally. Taryn has a beautiful relationship with her grandmother Jemma, as her mother died when Taryn was in her teens, and her father never loved her or had a relationship with her, as he felt 'trapped' by his wife and daughter. Jemma is the grandmother we would all wish for - sewing quilts, baking cakes and cookies, and protecting with love. Jemma, too, made a mistake in the name of love twelve years earlier, and like Taryn, has consequently lived with the guilt. Justin is the boy that Taryn had grown up with, and who had loved her, but she had not seen him for twelve years, since a terrible argument where he accused her of being 'too needy', and she released him to pursue his career. Now Justin is back in town, and Taryn is bound to run into him, but what will she say to him? Can they pick up the pieces after twelve years apart? Is it possible for them to ever be 'just friends'? I received a copy of Quilted By Christmas and have been blessed by it. It explores human relationships and family bonds, showing that even actions motivated by love can have far reaching consequences. Recognising God's unconditional love is vital. Love is the bond that ultimately binds us all together, and whilst past actions may hurt, forgiveness must be both given and accepted, so that future love is not missed. I thoroughly enjoyed Quilted By Christmas, and whilst it is good to read it in the festive season. It can be read any time as there are life lessons for us all to learn. A small mountain town in North Carolina. What a perfect setting for a North Carolina gal to read a book about and it is also a charming Christmas read. Gotta be good! So let’s see…..
High school sweethearts Taryn McKenna and Justin Callahan don’t quite make it to the altar. They go their separate ways – Taryn to college and Justin into the military. Twelve years pass. During that period of time the two have lived full lives. Taryn is a school teacher, loved, respected. Justin has returned from ho A small mountain town in North Carolina. What a perfect setting for a North Carolina gal to read a book about and it is also a charming Christmas read. Gotta be good! So let’s see…..
High school sweethearts Taryn McKenna and Justin Callahan don’t quite make it to the altar. They go their separate ways – Taryn to college and Justin into the military. Twelve years pass. During that period of time the two have lived full lives. Taryn is a school teacher, loved, respected. Justin has returned from honorable military service to take over his father’s construction business. Into the mix is a beloved grandmother – Jemma. Feisty, hard and robust as mountaineers go, beloved by granddaughter Taryn and Justin as well. But an accident looms and it brings down Jemma and lands her in the hospital. It brings Taryn and Justin back together again because of their love for her. And then the fun begins. Now how in the world does a quilt come into play in a Christmas story, a story about an injured grandmother, and boy meets girl after twelve years? Well, it all comes down to tradition – mountain and family tradition. We get a bit of romance (sweet), a bunch of anger, a heaping of secrets, and a bit of sewing by……. well, you’ll just have to read it yourself to find out. I really enjoyed this story, and literally, once I started it, I couldn't put down, I just had to find out what was going to happen with Taryn and Justin. This was a lovely holiday romance that kept me thoroughly entertained. Taryn's grandmother, Jemma, was a real character, even though she was in the hospital she had more life in her than most people. I really enjoyed the faith element of this book and how close Taryn was with Jemma, it was a very refreshing read indeed. This story made me tear up a bit. I so wanted to find out what ultimately happened between Taryn and Justin. Funny how a fictional story can do that kind of thing to your psyche. This was a beautiful Christmas read. I received an e-copy of this book from Net Galley in exchange for an honest review. Amazing book with many stories and remarkable endings. This is the first Quilts of Love book I accidentally stumbled on.... safe to say my goal now is to read all of them. Love faith based books that carry life long lessons. Being a quilter myself was just an extra added bonus! I know how important the idea of a quilt as a gift is to the piecer and the recipient. The story line was incredible! Each of the Quilts of Love novels are perfect for a little romance with a quilt as the setting around which the story itself revolves. Any of them can be read in any order even though they all belong in the series. Quilted by Christmas from Jodie Bailey takes an Irish Chain Quilt and weaves a story of high school romance that is given an opportunity for a second chance. After reading this one, it makes me want to break out my quilting supplies again while my daughters are still single. Taryn McKe Each of the Quilts of Love novels are perfect for a little romance with a quilt as the setting around which the story itself revolves. Any of them can be read in any order even though they all belong in the series. Quilted by Christmas from Jodie Bailey takes an Irish Chain Quilt and weaves a story of high school romance that is given an opportunity for a second chance. After reading this one, it makes me want to break out my quilting supplies again while my daughters are still single. Taryn McKenna and Justin Callahan grew up as best friends who fell in love before they turned eighteen. Through a series of arguments that dealt with the differences in how each of them were raised, they soon parted ways. Now that Taryn has turned 30, she is wonders if all those secrets from her past will keep them apart when she learns that Justin has come home after serving in the Army. If she can only find a way to tell him the one thing she should have 12 years ago that may or may not have changed where they find themselves today. Jemma, Taryn's feisty grandmother is in the process of passing down a time honored tradition of hand sewing an Irish Chain quilt for Rachel, her niece since both girls have lost their mothers, Jemma is all they have left to ensure that the family tradition of handing down the quilt as a marriage gift continues on. She also knows how much Taryn has loved Justin and the circumstances that have kept them apart. In fact, she knows just how to make all the necessary arrangements to ensure they spend time together as Christmas nears and she has so much to do. will Taryn overcome the hold of her past and find forgiveness and true happiness? What Secret has Taryn kept? Taryn’s grandmother Jemma also has kept a Secret. what is her Secret? Taryn is corralled into helping Grandma work on a final project—an Irish chain quilt that tells the story of who history ? will Taryn and Justin be more than friends? I was a goodreads first reads winner of "Quilted by Christmas:Quilts of Love series"
Quilted by Christmas by Jodie Bailey is a wonderful well written 5 stars book. I am looking forward to reading more books Jodie Bailey. Quilted by Christmas by Jodie Bailey is a short and sweet novel that brings the magic of the holiday alive within a family and high school romance returned from the grave. Bailey gives readers the chance to learn the meanings of forgiveness in her novel, takes place in small North Carolina mountain town. The first novel I’ve read in the Quilts of Love series, I will be sure to read more of these darling books because Bailey made a strong impression as a storyteller and writer in Quilted by Chris Quilted by Christmas by Jodie Bailey is a short and sweet novel that brings the magic of the holiday alive within a family and high school romance returned from the grave. Bailey gives readers the chance to learn the meanings of forgiveness in her novel, takes place in small North Carolina mountain town. The first novel I’ve read in the Quilts of Love series, I will be sure to read more of these darling books because Bailey made a strong impression as a storyteller and writer in Quilted by Christmas. Combinding a spunky grandmother, an army hero, and a sweet high school teacher, Quilted by Christmas is a story of a broken high school romance that is rekindled between a hero’s return, a heroine’s redemption, and a grandmother’s love demonstrated through an Irish chain quilt. Bailey intricately weaves lessons of forgiveness and love through her main characters as they come to find and demonstrate God’s love for His children within their own lives. Taryn McKenna, broken from abandonment and believing she is not worthy of love after a few disastrous mistakes, struggles to believe she will find happiness even when her longtime love returns from military duty. In Quilted by Christmas, Bailey shows readers that God’s love outweighs every move we make through the lessons Taryn learns as she forgives herself and others. Justin Callahan returns to North Carolina with hopes to reconcile with Taryn, after leaving twelve years earlier in the midst of a heated argument that ended their relationship. A hero worthy of any female reader’s admiration, Justin’s actions and words are a constant reminder that while forgiveness may not be easy, it is the only way to relieve burdens and move forward from past mistakes. In the middle of these two characters is the feisty Jemma, Taryn’s grandmother and Bailey’s center for all things in Quilted by Christmas. Quick witted, sarcastic, and loving, Jemma provides readers with laughter in just about every scene. I particularly enjoyed her, as well, because Jemma is not perfect and her mistake that comes to light about three-quarters of the way through the book begins a denouement much different than I expected. Quilted by Christmas has a few moments that took me by surprise—I enjoyed the book much more than I thought I would because of those scenes, and now I have higher expectations for the rest of the series that I’m confident will be fulfilled if the authors are in any way similar to Bailey. This novel was a pleasurable read that I would consider rereading if in need of a light feel-good story. The Scriptural lessons sprinkled throughout the novel are hidden enough to not be too obvious but still available for readers to analyze without complications internally and externally of the story. I recommend Quilted by Christmas for female readers who enjoy light contemporary holiday novels. Justin Callahan has returned to town after being in the Army for 12 years. When he left at age 18, he left behind his girlfriend after a huge argument. He now returns after leaving the military to help his father run the family construction business. He sees Taryn and begins to wonder if they can rekindle what they once had. He knows that he has returned a changed man, but will Taryn want anything to do with him after 12 years of absence? Taryn McKenna has been keeping a secret for 12 years. Her grandmother is the only one who knows about it. Taryn loves her grandmother, who raised her after her mother died when she was a young teenager. They are working on a quilt together for her cousin’s wedding on New Year’s Day, but events happen that threaten its completion on time. Taryn and Justin grew up together and she has loved him forever, first as a friend and then as something more. When he left, after saying some hurtful things to her, she was left with a choice as to how to proceed with her future. She has lived with her decision for 12 years and now Justin has returned. The truth weighs heavy on her heart, but will she have the strength to tell the truth? She has learned to rely on God and His strength, so she prays for his guidance. I really enjoyed this story with its look at real people who have choices to make and might make the right choice for the wrong reasons. Both main characters have matured in life’s experiences and in their faith as they reconnect 12 years later. There is hope, love and forgiveness depicted by more than one character in the story. I just loved the feisty character of Taryn’s grandmother or Jemma. She loves fiercely and protectively. She has down what she thinks is best for her granddaughter, but she learns that with age comes wisdom and that perhaps she didn’t make the best choices. The characters in the story were believable and I could connect with them emotionally, which made the story more enjoyable. Not too long before Christmas, Taryn finds her calm and quiet existence disrupted by Justin’s r It has been twelve years. Twelve years since that fateful night when Taryn McKenna pushed Justin Callahan, her high school sweetheart, to take the next step in their relationship. Taryn hasn’t seen him since. Reeling from the breakup and guarding a secret that must never come to light, Taryn went off to school, but soon found herself back home and is now a teacher in fictional Hollings, North Carolina. Jodie Bailey in her new book, “Quilted By Christmas” Book Twenty-Two in the Quilts of Love Series published by Abingdon Press brings us into the life of Taryn McKenna. From the back cover: Taryn is keeping a secret she never should have kept. Taryn McKenna believes she’s easy to forget. Abandoned by her parents and left behind when her high school sweetheart joined the army, she vows to never love again and throws herself into her love for the outdoors and the pursuit of a college degree-something Jodie Bailey in her new book, “Quilted By Christmas” Book Twenty-Two in the Quilts of Love Series published by Abingdon Press brings us into the life of Taryn McKenna. Taryn McKenna believes she’s easy to forget. Abandoned by her parents and left behind when her high school sweetheart joined the army, she vows to never love again and throws herself into her love for the outdoors and the pursuit of a college degree-something no one else in her family has ever accomplished. Her goal, as a young teacher in the hills of North Carolina, is to leave a legacy in the lives of the middle-schoolers she teaches.When Taryn’s grandmother Jemma, the only other person who ever held her close, has a heart attack that reveals a fatal medical condition, Taryn is corralled into helping Grandma work on a final project-an Irish chain quilt that tells the story of her history and the love Jemma knows is out there for Taryn. As the pieces of the quilt come together, Taryn begins to see her value. Can she learn to believe that God will never leave her behind even though others have? Twelve years before Taryn and Justin had a great relationship but secrets broke them apart. Now Justin is back in town and Jemma, Taryn’s grandmother, knows exactly what to do to get them back together again. “Quilted By Christmas” is all about what happens when we are not open and honest with one another. They cause a great deal of pain and misunderstanding which, of course, gets in the way of the relationship. Ms. Bailey has given us a great deal of story that all works itself out over the creation of the Irish chain quilt. There are moments of great fun and moments of high emotion but through it all there is lots of love. This book will keep you thinking. My thanks to NetGalley and Abingdon Press for an eARC copy of this book to read and review. Ranty spoiler-fest follows, please be warned. I got 15% of the way into this book. That was when the "Big Secret" was finally revealed to the reader. That's when this reader deleted it off of her Kindle. It started off in the typical romance way. Young couple in love was torn apart because the female MC had a "Big Secret" and decided to break up with the male MC, rather than ruin his life by telling him the My thanks to NetGalley and Abingdon Press for an eARC copy of this book to read and review. It started off in the typical romance way. Young couple in love was torn apart because the female MC had a "Big Secret" and decided to break up with the male MC, rather than ruin his life by telling him the truth. He leaves for 12 years to be in the military. They were like 18 when they broke up, please note. The book starts off the MCs are in their 30s and the male MC has just come back to the small mountain town where they were both from. Everyone in the town believes the female MC was an idiot for breaking up with the male MC, even her family. The grandmother is trying to get them back together. That's when the "Big Secret" was revealed via the female MC's thoughts. She was pregnant and gave the baby up for adoption WITHOUT TELLING HIM AT ALL!!!!! Ok, not all men are cool with having kids, but he should have had a CHOICE in the matter. I mean, that's half of his DNA. Let him have the choice to walk away or take responsibility for his actions. But to make the decision for him, that's just WRONG. I'm assuming that she tells him the truth eventually, that he has a 12 year old child being raised by complete strangers, who he has no legal rights to whatsoever. I don't care if the kid was adopted by a family member and accessible to both of the MCs. The whole thing just rankled me. I don't see how this is a religious book. I know, I know, for a Christmas book, you need a big bad thing that needs to be overcome by the Christmas miracle, but this was just too much for me to swallow. I’ve been enjoying the Quilts of Love series for some time now and when I saw the Christmas themed one, Quilted by Christmas I knew I had to add this one to my read pile. I’ve never had the chance to read any of Jodie Bailey’s other titles but this one has me definitely wanting to check them out, right away we are introduced to Taryn McKenna who has carried around a secret for years and the townspeople who think she let a good one get away. The book is a good example of why “words will never hur I’ve been enjoying the Quilts of Love series for some time now and when I saw the Christmas themed one, Quilted by Christmas I knew I had to add this one to my read pile. I’ve never had the chance to read any of Jodie Bailey’s other titles but this one has me definitely wanting to check them out, right away we are introduced to Taryn McKenna who has carried around a secret for years and the townspeople who think she let a good one get away. The book is a good example of why “words will never hurt me” is so wrong – words that are spoken in anger and spite and left to fester cause wounds that can’t be seen but must be healed as much as an seen wound. As Justin Callahan arrives on the scene again and back into Taryn’s life she can’t seem to avoid him as her Grandmother keeps hiring to do odd jobs around her house – then Taryn finds the beginning of a quilt – and the mystery begins. Jodie Bailey sets most of Quilted by Christmas in North Carolina, where testimonies run true, quilting is commonplace, politeness prevails, friends often become kin. In case you've read the teasers or started reading the book, I won't include spoilers in this review, so I'll simply say Quilted by Christmas is such a good love story about Taryn and Justin (from when they were late teenaged lovers, to more than a decade later when they'd grown in chronology, maturity, and self-understanding), such an accurate account of the sometime messiness of being human, and a lovely portrayal of contemporary southern Appalachian life in ways that also honors tradition, because for the most part, daily living in the American South still is about rich heritage as it necessarily looks into an uncertain, changing future. 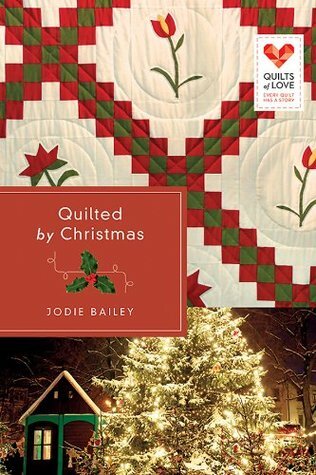 Although author Jodie Bailey is unabashedly Christian, and Quilted by Christmas is a book in United Methodist pub house Abingdon's Quilts of Love series, the narrative is not overtly spiritual, Christian, or generically religious, and likely would offend only those actively seeking to be offended. In a growing line of books, in the "Quilts of Love" series, that centers around a quilt theme, "Quilted by Christmas" is out in time for the Christmas season. Family relations are hard and its harder when they reached out to further generations than we expect, in negative and not positive ways and its a reminder, in subtle ways of the difficulties of the holidays, particularly Christmas time. Going through "Quilted by Christmas" was emotional wrenching as the lead character, Taryn, finds herself i In a growing line of books, in the "Quilts of Love" series, that centers around a quilt theme, "Quilted by Christmas" is out in time for the Christmas season. Going through "Quilted by Christmas" was emotional wrenching as the lead character, Taryn, finds herself in difficult positions with the people around her and her solution, it felt was to try and run...to suppress...to be what she thinks is being independent. Being use to the idea of abandonment, first her parents, than someone she loved, Jodie Bailey wrote a broken character who really tries to be strong, even in the face of trying to feel an emptiness in her life that seems to be characterized by manipulation, presumption and abandonment. The characters of the book are strong and so is the message that while others may fail and abandon, God never does. This is not a book that can be easily read without reaching for a box of tissues and for some...seeking God for the needed healing. There's nothing like a feel good Christmas quilt story to get you in the holiday spirit! Quilted by Christmas is a great reminder about all the good things in life in times when it seems only bad things happen. Taryn has some issues stemming from her childhood and past and then the past comes knocking on her door! She basically has a "nobody loves me, everybody hates me" complex and has isolated her heart to protect it from any more damage. When one of the sources of her pain suddenly reappears i There's nothing like a feel good Christmas quilt story to get you in the holiday spirit! Quilted by Christmas is a great reminder about all the good things in life in times when it seems only bad things happen. Taryn has some issues stemming from her childhood and past and then the past comes knocking on her door! She basically has a "nobody loves me, everybody hates me" complex and has isolated her heart to protect it from any more damage. When one of the sources of her pain suddenly reappears in her life just as quickly as he disappeared, everything gets turned upside down. Things go from bad to worse when the one person who she can rely on's health is in question. Taryn has to learn some hard lessons and let go of her painful past so that she doesn't miss out on the future. As with all the books in the Quilts of Love Series, there is a quilt involved! Taryn's Grandma is making one and she needs to help her get it finished. I liked Taryn and could relate to some of her issues and I think that a lot of people will. This is an easy, quick read which I always love during this busy time of year. Sometimes you just want a book that makes your feel good without thinking too hard and gets you lost in someone else's life. Sometimes after deep heartache, you feel the tears dry and you think maybe I have moved on. Just to find out that years later there is so much emotion, hurt, and pure love that you still hold on to, for that individual. Time doesn't heal all wounds, it just puts a band aid on the situation. Taryn soon realizes this after her first love returns to their town after an extended stay abroad after serving in the Army. But soon her past and her reality will face each other when Justin returns to help his father. Taryn has survived all these years without Justin holding on to a secret that only Jemma--her grandmother knows. Taryn has been so busy taking care of her grandmother expecting it not to go badly but at last fate has reared its ugly head and Jemma's illness has taken a turn for the worse. Jemma has made a request that Taryn may have to see through on her own. So now not only is Taryn faced with the reality of her first love's return, but also the secret that once again will have to come to the surface, but her grandmother's health also weighs in the balance of it all. Taryn will have to rely on God for such an endeavor as this, will she trust Him enough to carry the weight of the load? If you are interested in learning more, you can at this link. **Disclosure** This book was sent to me free of charge for my honest review from CFBA. There are very few people in this world who had a “perfect” childhood and even less who don’t at leasy know someone who had a rough time as some point in their life – so I believe almost everyon Quilted By Christmas is one of those books I just LOVE to read at this time of year. QUILTED BY CHRISTMAS is the first book I've read by Ms Bailey. Taryn deals with a lot of issues, fed by lies, and even though her grandma loves her, she has fed the lies, keeping them alive. The story is well-written, engaging, even though I never fully connected with the characters. When the quilt planned for Taryn’s cousin is destroyed, Taryn finds another quilt started and unfinished in the attic. Taryn starts it, helped by her ex-boyfriend, Justin, who is getting acquainted with his feminin QUILTED BY CHRISTMAS is the first book I've read by Ms Bailey. Taryn deals with a lot of issues, fed by lies, and even though her grandma loves her, she has fed the lies, keeping them alive. The story is well-written, engaging, even though I never fully connected with the characters. When the quilt planned for Taryn’s cousin is destroyed, Taryn finds another quilt started and unfinished in the attic. Taryn starts it, helped by her ex-boyfriend, Justin, who is getting acquainted with his feminine side. I could see the end coming full speed right at the broadside of the barn, and sure enough, it hit. Head on. The issues are not resolved to this reader’s satisfaction by the end of the book, leaving me sad. However, there is a hint, that maybe, with some time, tender-loving care, and God’s grace things might work out. If you are looking for a Christmas romance with a quilt in the story line, pick up QUILTED BY CHRISTMAS. It was a good, quick read. There were some laugh out loud moments, lots of humor. Available in ebook and in paperback. 240 pages. This is a well-written story which looks at two young people separated by eleven years and an argument. A girl in a small town hoped to marry a boy but they argued when he enlisted in the army. He now returns to find that she is still single and both of them are needed to help older family members. I liked that the lad was quite normal and decent, not one of the kind who never really leaves the service but wants to run security firms and spy missions like in so many dramatic books. However I did This is a well-written story which looks at two young people separated by eleven years and an argument. I have read several of books in the Quilts of Love series and I must say this one was one of my favorites! Ms. Bailey is a new to me author, but her writing style certainly captured my attention from the get go! She creates compelling characters that one wouldn't mind spending time with in real life.Taryn is grappling with issues that are all to real. Being abandoned has allowed her to believe that she doesn't really matter. It was so nice to see her character grow and change as the story progre I have read several of books in the Quilts of Love series and I must say this one was one of my favorites! Ms. Bailey is a new to me author, but her writing style certainly captured my attention from the get go! She creates compelling characters that one wouldn't mind spending time with in real life.Taryn is grappling with issues that are all to real. Being abandoned has allowed her to believe that she doesn't really matter. It was so nice to see her character grow and change as the story progressed. Her grandmother Jemma is an interesting character, but like several other characters in the story she has a secret. Now her health is failing so she wants Taryn to help her finish a quilt. I loved the story that revolved around the quilt, as the pieces of the quilt go together Taryn starts to realize several truths about herself. While I enjoyed to romance in the story, it was actually the family feel of the story that was my favorite aspect. Quilted by Christmas is a great addition to the Quilt of Love Series. I have read a couple books from the "Quilts of Love" series, and this one was just as good!! All the books have a quilt theme, but are written by different authors with completely different stand alone story lines. "Quilted by Christmas" is a story about Taryn who lives in North Carolina with her grandmother. She struggles in the book because of her past relationships with an ex boyfriend, her father, and her faith in God. My heart hurt for Taryn and some of the decisions she had to make at a yo I have read a couple books from the "Quilts of Love" series, and this one was just as good!! All the books have a quilt theme, but are written by different authors with completely different stand alone story lines. "Quilted by Christmas" is a story about Taryn who lives in North Carolina with her grandmother. She struggles in the book because of her past relationships with an ex boyfriend, her father, and her faith in God. My heart hurt for Taryn and some of the decisions she had to make at a young age and wondering whether she made the right choice or if it was a selfish choice. I loved that she found answers to her questions and found love, trust, and forgiveness by the end of the book. I really enjoyed this book and would recommend it. It was light christian fiction reading with some romance centered around Christmas time. Jodie Bailey is the author of Quilted by Christmas, as well as two suspense novels, Freefall and Crossfire and a novella in Holiday Defenders. Her devotions have appeared in Fighting Fear: Winning the War at Home and Sweet Freedom with a Slice of Peach Cobbler. She is also a contributor to PWOC International’s e100 Bible study for military wives. Her memberships include American Christian Fiction Jodie Bailey is the author of Quilted by Christmas, as well as two suspense novels, Freefall and Crossfire and a novella in Holiday Defenders. Her devotions have appeared in Fighting Fear: Winning the War at Home and Sweet Freedom with a Slice of Peach Cobbler. She is also a contributor to PWOC International’s e100 Bible study for military wives. Her memberships include American Christian Fiction Writers. When not at the keyboard, Jodie is a former middle school literature teacher and yearbook adviser who is convinced a camping trip to the beach with her family, a good cup of coffee, and a great book can cure all ills. Jodie lives in North Carolina with her husband, her daughter, and two dogs.